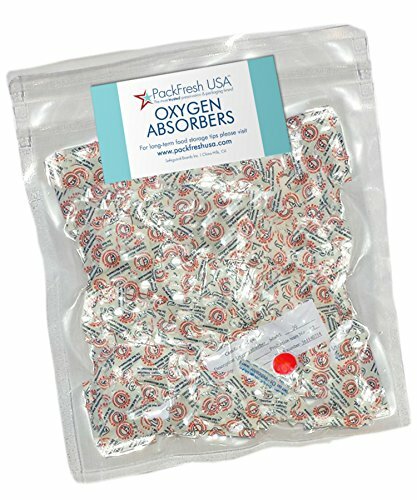 PackFreshUSA(TM) Oxygen Absorbers are guaranteed to absorb at least 180% of their rating, giving you a buffer of safety. Each package contains an oxygen indicator to guarantee freshness and we include our PackFreshUSA(TM) Long-Term Food Storage Guide with every purchase containing a chart to help you know how many absorbers you should be using for your project. You are always welcome to send us your questions as well! This guide is your gift from the food science professionals here at PackFreshUSATM and contains knowledge you will not find anywhere else. This 3rd edition contains directions, more information and tips, plus a new section on a special process to avoid freezer-burn. We guarantee than you will receive your order through rain, sleet, or gloom of night and you will be completely confident in the security of food stored with our products or we will give you a complete refund - always! If you have any questions about this product by PackFreshUSA, contact us by completing and submitting the form below. If you are looking for a specif part number, please include it with your message.